Looking for a way to light up your garden in the evening? The White Cleome is your answer. The cleome comes in many colors, and I have planted this flower for all of my gardening years; but I fell in love with the white variety because of its ability to help light up the garden at night with minimal exterior light. The White Cleome has many strengths as a flower. It gives your garden an instant English Cottage Garden style. It is very easy to grow and grows best in full sun, but I have had success growing it in partial sun and even some shadier spots. It is also very easy to grow from seed in the sunnier areas of your garden. My favorite method for growing the cleome is to buy a flat of them at Brennan’s or Johannsen’s. Then I plant them around my entire yard. After they are all planted, I then sprinkle the white cleome seeds I saved from the year before all around the newly planted flowers. This way when the first plant has grown, bloomed and gone to seed, the new little seedlings are up and strongly growing, extending the period this flower will be in full bloom until the first frost.The White Cleome is an annual, but it does re-seed itself, and the seeds are super-easy to collect, as they are the part of the flower that looks like cat’s whiskers. Another growing tip for this flower is to stake it. Or since I grow so many and stakes are a hot commodity in my garden, I prefer to put my grass clippings from my lawn mower around them, with coffee grounds over the clippings to hide them. This gives the flower enough support and also provides beneficial nutrients and does wonders to amend my garden soil. Earthworms love my yard. 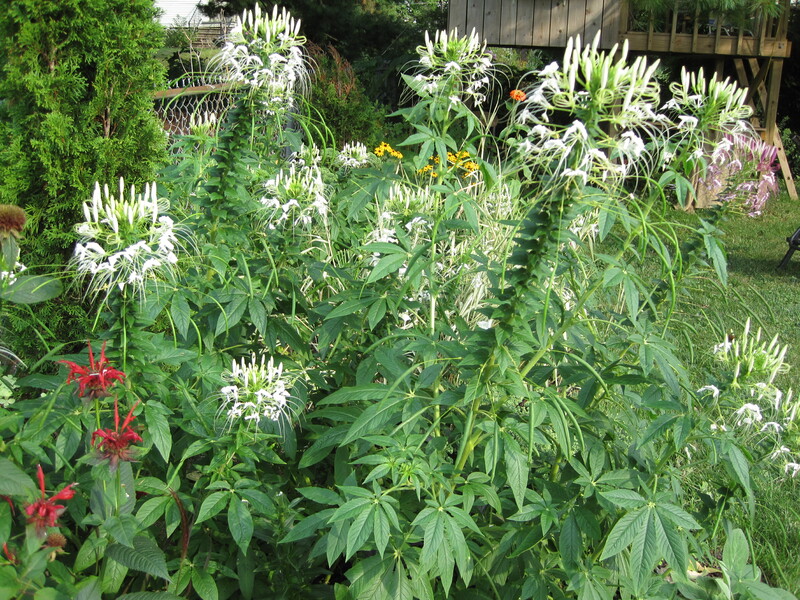 I developed this method of growing the White Cleome throughout the entire border of my yard, both sun and shade, the first summer we lived in our current house. I started this garden from scratch and needed something to fill in between the baby perennials and shrubs to give my garden bed a full English Cottage Garden look. This flower will give your garden a very full look, as one plant will produce many, many flowers. Even now that my perennials have filled out, I continue to plant the White Cleome flower throughout the entire border of my yard because I love the way it looks in the daytime and lights up the yard at night.